Along with the entire XBRL and Data Transparency community, RDG Filings has been closely following the proposed bill circulating through Congress on the committee level that would exempt as many as 80% of public companies from the XBRL requirement (see page four of this memo from the Financial Services Committee for details). RDG was not alone in thinking that the proposal would be an unfortunate step backward in the move toward increased transparency and availability of public companies’ financial disclosures. While there are certainly improvements to be made to both the data quality and to the SEC’s enforcement, RDG firmly believes that XBRL is a tremendous advancement and that rolling it back or doing away with it altogether would be a mistake. Happily, today it was released that the bill will not be introduced, and the push to abandon or delay the XBRL requirement will stop (at least for the time being). XBRL has already been adopted by many countries around the world, and it is the future of financial reporting. RDG agrees with Columbia University’s Center for Excellence in Accounting and Security Analysis that there is a “clear demand for timely, structured, machine-readable data” among investors. Much of the XBRL data that is currently required by and submitted to the SEC is not of a high enough quality to properly satisfy this demand, and Congress should continue to pressure the SEC to improve XBRL data quality. 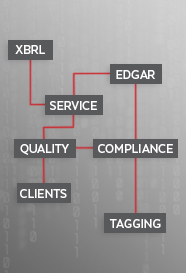 However, simply eliminating XBRL altogether is not a fix, it would, rather, just be a reversion to 1930’s technology.